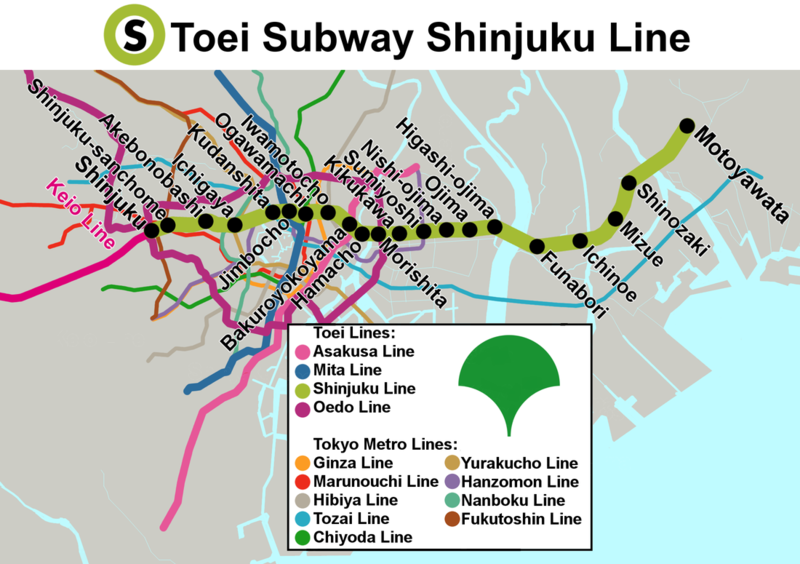 The Toei Subway Shinjuku Line is a subway line owned and operated by the Bureau of Transportation Tokyo Metropolitan Government that connects Shinjuku Station in Tokyo with Motoyawata Station in Chiba Prefecture. Toei Subway uses a light green to identify the Shinjuku Line and it has the alphabetic code S. Shinjuku Station is S-01 while Motoyawata Station is S-21. 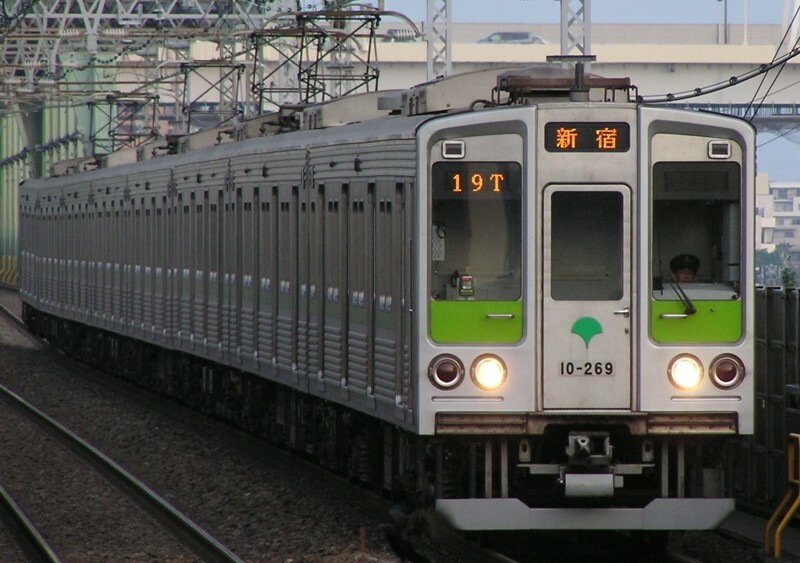 The Shinjuku Line connects with the Keio New Line at Shinjuku Station and shares the same 1372mm Scotch gauge rails. It is the only subway in Japan to use this rare track gauge. Along with the Tokyo Metro Tozai Line, the Shinjuku Line serves as a bypass for the JR Chuo Sobu Line. Though not as crowded as the infamous Tozai Line, it still has crowds of up to 173% according to the Ministry of Land, Infrastructure and Transport. Express trains are operated during the daytime hours and provide much faster service from end to end than regular trains. No extra fees are required to ride the express. Construction of the Shinjuku Line began in the early 1970s and the first portion of Iwamotocho Station to Higashi-ojima Station was opened in 1978. The line itself was completed in 1989, but Motoyawata Station was not completed until 1991. The Shinjuku Line was for a long time the only subway in Tokyo to not use trains with variable frequency drive. This was due to the system causing inductive interference in the signal system. In 2005, a new digital ATC signal system was introduced and the variable frequency drive equipped 10-300 Series was introduced. Toei Subway's Shinjuku Station is separated from the other companies' Shinjuku Stations but is still a very crowded station during morning and evening rush hours. The Shinjuku Line enters the Keio New Line at Shinjuku and continues on to the Keio Line. You can also transfer to the Keio New Line, Odakyu Odawara Line, Toei Oedo Line and the Tokyo Metro Marunouchi Line here. 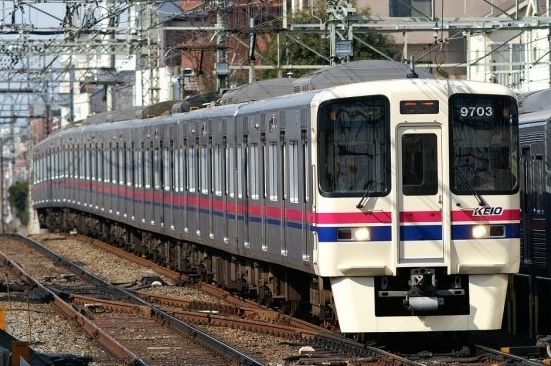 For JR, you can transfer to the Chuo Rapid, Chuo Sobu, Saikyo and Shonan-Shinjuku Lines. 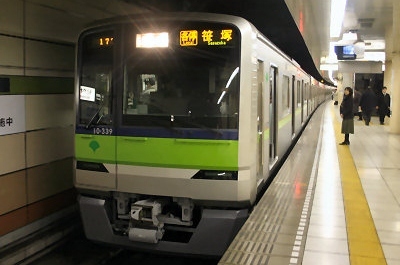 The limited expresses Azusa/Super Azusa, Kaiji, Narita Express, Nikko and Kinugawa stop at Shinjuku Station. Located in the Chiyoda Ward of Tokyo, Kudanshita is one of the closest stations to the famous Budokan Hall where big-name groups such as the Beetles and Queen performed. It continues to be a very popular venue for artists from all over the world so if concerts are you're thing, you might find yourself using Kudanshita Station. You can change to the Tokyo Metro Tozai Line and Hanzomon Line at this station.